Since this year’s U.S. Capitol Christmas Tree was cut from the Colville National Forest on Nov. 1, it’s traveled through nine states. 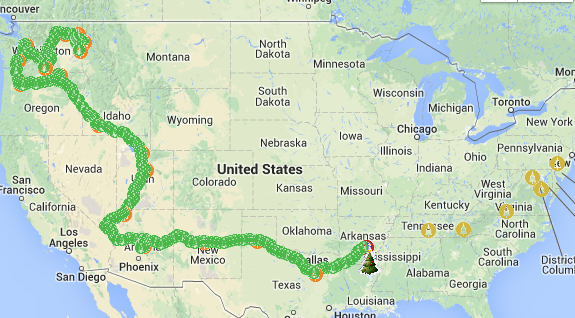 Right now it’s in Arkansas and it’s only got a week left on the road before it reaches Washington D.C. on Nov. 25. So here’s another fun thing about the tree: It’s helping research along the way. A Washington State University researcher put three small sensors on the tree to measure temperature and moisture content during the tree’s 25-day journey. Forest service technicians caring for the tree will also send daily twig samples to the WSU plant pathology department in Puyallup. 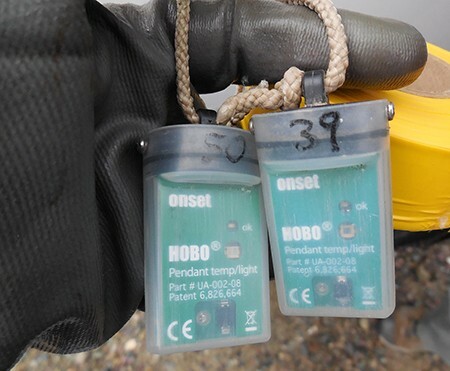 HOBO tree sensors are collecting data along the way. The data will be compared to research on normal house-sized trees and the previous U.S. Capitol Christmas Tree that came from Washington state, a 65-foot Pacific silver fir harvested from the Olympic National in 2006. Keeping trees moist and fresh during transport is a big deal for the Northwest’s Christmas tree industry. Washington is No. 4 in the nation for Christmas tree production, and Oregon is No. 1, according to the Pacific Northwest Christmas Tree Association. The two states together have an estimated 2013 harvest of 8.7 million Christmas trees, worth $145 million. Here are tips from the National Christmas Tree Association about how to keep your own tree fresh longer.